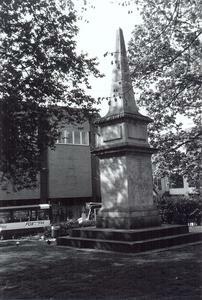 Obelisk sets on a pedestal, plinth and four stepped base. Pedestal bears a carved wreath with the number '52', referring the old number of the Battalion as a Regiment of the Line. Plinth bears carved inscription and names. 2009: Renovations completed. Some lettering recorded as missing from memorial. 16 March: report of graffiti in ink on the west side of the memorial. 2006: Plan to redevelop the area surrounding the memorial. Memorial will be cleaned and a step added, as surrounding paving will be lowered. Oxfordshire Light Infantry Regimental Chronicle 307-316 / 1900 Report of unveiling from Oxford Mail 7 July 1900. Local Publication/Booklet pp. xxv-xxvii, liii. 'The Risings on the North-West Frontier' (Allalabad, 1898). Composition of the Tirah Field Force, and casualties. Local Publication/Booklet Ppp.82-83. Philip Booth: ' The Oxfordshire and Buckinghamshire Light Infantry (London, 1971). OLI ordered from the Punjab to join Tirajh Expedition. Later Sgt Maj. Dempsey was wounded, received DCM and later died in hospital. The Times 3 Jan. 1898 p.3;16 Mar. 1898 p.5 Reports of Oxfordshire Light Infantry in Tirah. The Times 22 Nov. 1897 p.5; 24 Nov. 1897 p.6;17 Dec. 1897 p.12; 20 Dec. 1897 p.10; 20 Jan. 1898 p.7 Reports of the murder of Maj Thruston, Mr N A Wilson and Mr Scott by Sudanese mutineers in Uganda, and progress of the mutiny.